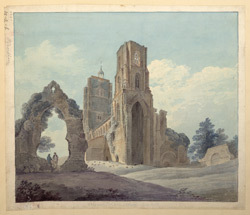 South-east view of the picturesque ruins of Wymondham abbey. Once a small priory of 10 to 20 monks, it was elevated to abbey status in 1448. The ruined abbey is situated in a churchyard amid pine trees. In the 18th century it became fashionable to study and draw the remains of ancient buildings and this is one of many drawings of ecclesiastical ruins in the King's Topographical Collection.